Spirit of Detroit — decked out in maize and blue during U-M’s Detroit Bicentennial Festival. Wolverines throughout the state are making a difference — from research to entrepreneurship to outreach. Michigan Impact is an e-newsletter that tells their stories. 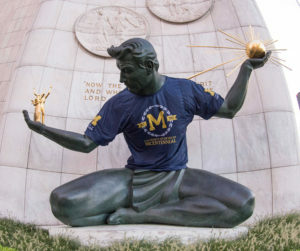 The university’s Office of Government Relations produces regionally focused editions of the newsletter three times each year and distributes it to thousands of U-M alumni living across Michigan, from Marquette to the Motor City. Check out Michigan Impact to learn about more how faculty, staff, students and alumni are working hand-in-hand with Detroit stakeholders and community members to improve economic outcomes and the quality of life in the city and beyond.